For those of you who've been following this blog for a while, you may be aware of my quest for the perfect handlebar bag. For quite a while, I used the Topeak Compact Handlebar Bag, which works quite nicely. For one bike-camping trip I took last year, I tested out the Detours Mini Met Handlebar Bag, which I reviewed here. I've also dabbled with using a fanny pack, but we won't get into that here (I was young, I was experimenting...). Both the Topeak and the Detours handlebar bags have the advantages of a high-end handlebar bag: a quick-release mount that lets you easily remove the bag, plenty of space for the basics that you want quick access to during a ride (wallet, camera, cell phone, keys), included rain cover, and the obligatory detachable shoulder strap to convert the bag to a man-purse. 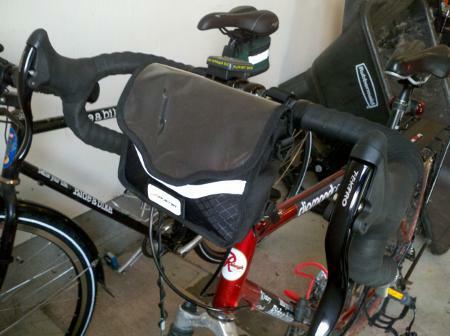 You can order extra handlebar brackets to make it easy to use these bags on multiple bikes. Despite all of their advantages, the above style of bags have two small drawbacks. One, the mounting brackets tend to interfere with other accessories. You have to mount your cyclocomputer on your stem, or move it far to the side on your handlebar, which on a road bike, can then run out of space with the handlebar tape. 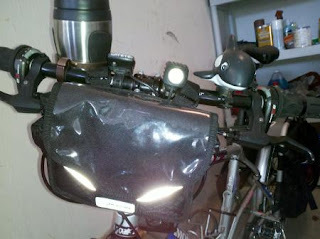 Plus, the bag blocks a handlebar-mounted headlight. You can get around these problems with an optional handlebar extension for accessories. The other issue I've had is that there are times when I want to use a handlebar bag on a particular bike, but for the times that I don't need the bag, I don't want the bracket hanging around there. This is where the Avenir Mini Metro Handlebar Bag comes in. Compared to the Topeak and Detours bags, it is un-ashamedly low-tech. It attaches to your handlebar using a pair of velcro straps, plus a stabilizer strap that wraps around your steerer tube or head tube. The velcro straps have enough slack that you can position them around your other accessories in most cases. It's got one main internal compartment, plus a smaller zippered compartment under the flap. The flap has a clear map pocket on top, a favorite feature among touring cyclists. There's a reflective strip on the front, plus a reflective loop for a clip-on light. It's also got a side pocket, which is probably too small for most of the latest smartphones, but would probably work well for an older flip-style phone or a folding multi-tool. As you can see, it attaches without blocking my headlight (NiteRider MiNewt Mini-USB), plus leaves plenty of room for all of my other dorky accessories (Cat Eye Enduro 8 computer, Origin8 Joe-2-Go coffee cup holder, and killer whale squeeze horn). I've been pretty pleased with it after using it on several rides. The flap is held in place with velcro, so you've got quick access to the contents to grab your phone to answer that important call from your stockbroker, snap a picture of roadside flora and fauna, or jot down the license plate number of the SUV that just buzzed you. The velcro straps are not as quick to remove and attach compared to a quick-release bag, but they're easy and do the trick. The outer material is made of 420-denier ripstop nylon for awesome durability. There's no claim of water-proofiness; I think it would keep your stuff dry during a light mist, but I wouldn't count on it during a full downpour. I put my phone in a separate waterproof bag. 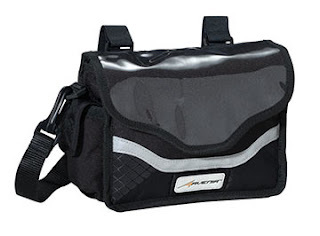 At $24.99, the Avenir Mini Metro is a steal for a convenient and easy-to-use handlebar bag. In stock in all three Century Cycles stores!